Description: As exquisite as lyrical poetry or music that echoes in your mind, Stanza features a decorative arrangement of staffs around the diffuser with matching accents, and quatrefoil designs around the trim. The frame, accents and hardware are featured in a hand applied Gilded Tobacco finish. 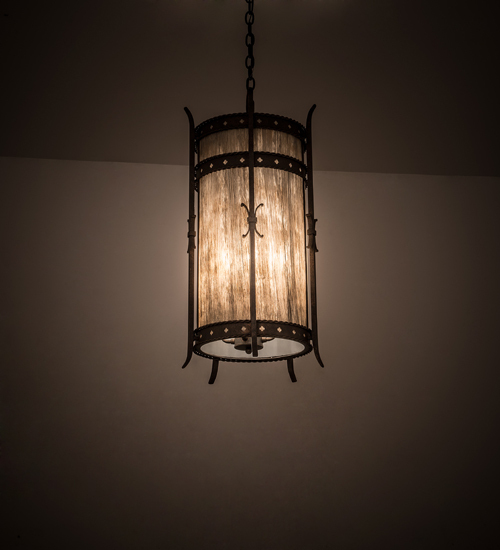 Beautiful ambient light evokes from Handpainted Ivory Idalight. Custom sizes, designs and finishes are offered, as well as dimmable energy efficient lamping options such as LED. This pendant is UL and cUL listed for damp and dry locations.